Building microservices at the scale of InVision, the leading product design collaboration platform, leads to complex architectures. No single engineer has a complete map in their head of service-to-service interactions. It’s too complex and is constantly changing which makes pinpointing the root cause of application performance issues a challenge. Distributed tracing is a critical tool for building and operating modern software applications. By giving you an end-to-end view of your application, tracing can help you build a better understanding of your software faster. Starting with the basics, this session will show you how to instrument your application in a way that will give you maximum leverage, whether you are working to improve baseline performance or diagnose an ongoing incident. We’ll use examples derived from the more than 10 billion traces we’ve analyzed from organizations such as Twilio, Lyft, and Github and show you how to use tracing to see your software from every angle. Nobody denies the importance of observability in modern production software: with microservices adding scale, concurrency, and frequent deploys, it’s getting harder and harder to answer even basic questions about application behavior. The conventional wisdom has been that metrics, logging and tracing are “the three pillars” of observability, yet organizations check these boxes and still find themselves grasping at straws during emergencies. The problem is that metrics, logs, and traces are just data – if what we need is a car, all we’re talking about is the fuel. We will continue to disappoint ourselves until we reframe observability around two fundamental activities: (1) detection and (2) refinement. In this session, we summarize the contemporary observability dogma, then present a new observability scorecard for objectively reasoning about and assessing observability solutions for modern distributed systems. Google deserves a lot of credit for imagining (and popularizing) what we now call "microservice architectures." With the benefit of hindsight, we now recognize that Google made mistakes during those early days of microservices. And unfortunately, the rest of the industry is repeating many of these mistakes today. What did Google get wrong about microservices, and how can we apply those lessons today? This tech talk will explore some basic concepts of distributed tracing. There is no way to understand the performance of modern applications and their microservices without complete, end-to-end traces. How can you explain failures if you can't even observe them? But traces on their own are just data. They are necessary, but insufficient for explaining system-wide patterns or validating root causes if they don't also provide the necessary context separating the golden signals from the noise. 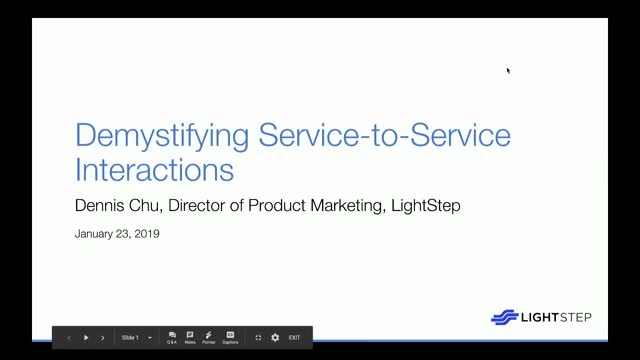 In this tech talk, you’ll learn how [x]PM has a unique approach to distributed tracing – capturing 100% of requests, across service boundaries through web, mobile, monoliths, microservices, and serverless functions. Also see how [x]PM guides you right to the traces that help you understand every performance bottleneck, outage, or rare anomaly of interest, so you can immediately pinpoint the root cause. Dennis Chu is the Director of Product Marketing at LightStep, where he and his colleagues deliver insights that put organizations back in control of their complex software applications. Dennis has over 10 years of experience developing and marketing enterprise IT and security software. Previously, he led product marketing at Tanium and was a product manager at Coverity (now Synopsys) and Intuit. Dennis holds a BSc in electrical engineering and computer science from the University of California, Berkeley. In the last twenty years, the internet applications that improve our lives and drive our economy have become far more powerful. As a necessary side-effect, these applications have become far more complex, and that makes it much harder for us to measure and explain their performance—especially in real-time. Despite that, the way that we both reason about and actually measure performance has barely changed. Hear Kay Ousterhout, Software Engineer at LightStep, as she discusses how to improve our mental model for recognizing and diagnosing system anomalies. Kay Ousterhout is a software engineer at LightStep, where she’s building performance management tools that enable users to understand the performance of complex distributed systems. Before LightStep, Kay received a PhD from UC Berkeley. Her thesis focused on building high-performance data analytics frameworks that allow users to reason about - and optimize for - performance. Kay is also a committer and PMC member for Apache Spark; her work on Spark has focused on improving scheduler performance. Ben Sigelman is the cofounder and CEO of LightStep, where he’s building reliability management for modern systems. Software has evolved tremendously over the past twenty years, but unfortunately the way that we both reason about and actually measure performance has barely changed. It’s time for people to stop thinking about software performance as a single number and see it as a shape. In this talk, we’ll present the case for unsampled latency histograms as an evolution of and replacement for simple averages and percentile estimates. - The historical context and evolution of in-application performance measurement, especially in the presence of microservices and FaaS/”serverless”. - Why time-series statistics are not enough to explain the behavior of modern systems. - How real-time latency histograms can radically improve the way we think about and manage application latency. While p99 latency remains a useful statistic, the complexity of today’s microservice architectures requires a richer and more flexible approach. Our tools should identify, triage, and explain latency issues, especially as organizations adopt microservices and introduce multi-modal and highly-variable performance profiles as a consequence. Ben Sigelman is the cofounder and CEO of LightStep, where he and his colleagues deliver insights that put organizations back in control of their complex software applications. An expert in distributed tracing, Ben is the coauthor of the OpenTracing standard, a project within the Linux Foundation’s Cloud Native Computing Foundation (CNCF). Previously, he built Dapper, Google’s production distributed systems tracing infrastructure, and Monarch, Google’s fleet-wide time series collection, storage, analysis, and alerting system. Ben holds a BSc in mathematics and computer science from Brown University. Interested in learning how you can manage the performance of your microservices and characterize latency? Join us as Dennis Chu, Director of Product Marketing at LightStep, shows how you can use sophisticated histograms and distributed tracing views to quickly and easily pinpoint the root cause of performance issues. The new latency histogram makes it quick and easy to discover and characterize latency behaviors in your application. The new sub-trace preview immediately shows you what's slow for a particular category. These powerful new features work for any service, span or tag values which provides you unparalleled flexibility. Join us for this webinar as Dennis Chu, Director of Product Marketing at LightStep, showcases these new capabilities. Organizations in a wide range of industries are rapidly adopting microservices because of the promise of greater agility and scalability. However, managing the performance of microservices-based applications introduces new challenges. Gartner stated in a recent report that traditional APM tools which were purpose-built for monoliths aren’t well suited to the dynamism, modularity, and scale of microservices-based applications. LightStep [x]PM cuts through the scale and complexity in today's software systems to help organizations tie system performance to business objectives. Join Dennis Chu, Director of Product Marketing, to learn how you can use [x]PM to handle account-level application performance management using 100% of your application's unsampled performance data. With [x]PM you can measure Service Level Objectives (SLOs) and create alerts on a customer-by-customer basis to deliver premium service and remediate problems proactively. The promise of increased agility and scalability is causing a fundamental shift in the market as organizations move from monolith architectures to microservices. However, the ongoing management of microservices can be overwhelming because traditional APM tools can’t handle their scale or complexity. When faced with a performance problem, teams often rely on dashboards that simply show the symptoms of the problem, or they end up digging through log files, which is like looking for a needle in a haystack. LightStep [x]PM was designed specifically for the microservices era. We help organizations measure what matters most, diagnose performance anomalies within seconds, pinpoint the root cause of issues faster, and dramatically reduce mean time to resolution. LightStep - cut through the scale and complexity of today's software. LightStep’s mission is to deliver confidence at scale for those who develop, operate and rely upon today’s powerful software applications. Its first product, LightStep [x]PM, is reinventing application performance management. It provides accurate, detailed snapshots of the entire software system at any point in time, enabling organizations to identify bottlenecks and resolve incidents rapidly. LightStep is backed by Sequoia, Redpoint, Altimeter Capital, Cowboy Ventures, and Harrison Metal, and is headquartered in San Francisco, CA. For more information, visit https://lightstep.com or follow at @LightStepHQ.